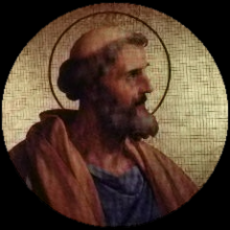 St. Celestine I was elevated to the Papacy on November 3, 422. He was a Roman from the region of Campania. Nothing is really known about his life prior to becoming Pope, except that his father’s name was Priscus. Legend tells us that He lived in Milan for a time, with St. Ambrose. The first known record of him is in a document from Pope Innocent I, from the year 416, where he is spoken of as “Celestine the Deacon”. Various portions of the Liturgy are attributed to him. Though he did not attend personally, he sent delegates to the First Council of Ephesus of 431. Four letters written by him on that occasion, all dated March 15, 431. There were also a few others, to the Bishops of Africa, to those of Illyria, of Thessalonica, and of Narbonne. St. Celestine was known for his love of orthodoxy. He sent Palladius to Ireland to serve as a Bishop in 431. In following him, St. Patrick continued this missionary work. He was zealous in refusing to tolerate the smallest innovation on the constitutions of his predecessors. St. Vincent of Lerins reported – Holy Pope Celestine also expresses himself in like manner and to the same effect. For in the Epistle which he wrote to the Priests of Gaul, charging them with connivance with error, in that by their silence they failed in their duty to the ancient faith, and allowed profane novelties to spring up, he says, “We are deservedly to blame if we encourage error by silence. Therefore rebuke these people. Restrain their liberty of preaching”. He worked hard to not allow heresies in his time. St. Celestine died on July 27, 432. He was buried in the Cemetery of St. Priscilla in the Via Salaria, but his body was moved. It now lies in the Basilica di Santa Prassede. In art, St. Celestine is portrayed as a Pope with a dove, dragon and a flame. St. Celestine I, was our Pope from 422 to 432. He was known for his orthodoxy, and his staunch promotion and defending of the faith. He sometimes said that the Clergy had failed in their duty of defending the faith, as in their silence they failed to speak up. It was during this time the many heresies were running wild and he did much to get his Clergy organized and to speak out against it. He paved the way for those to follow – setting the example to continue in building up the Church and to fight heresy.